Ready for a hot stock market tip? Not from me, mind you. But from the greatest stock market investor in history. Today, Warren Buffett is incredibly bullish on the financial sector. 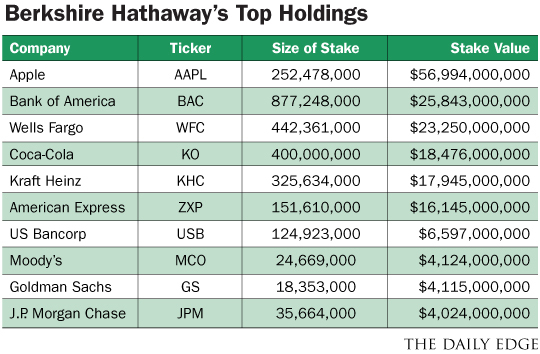 To figure that out, all you have to do is look at the equity portfolio of Buffett’s conglomerate Berkshire Hathaway. As of the last required reporting date (September 30, 2018), more than half of Berkshire’s top ten stock positions are American financial institutions! The table above details Berkshire’s top ten positions as of the end of the third quarter and the dollar amount invested. I count five banks Bank of America (BAC), Wells Fargo (WFC), US Bancorp (USB), Goldman Sachs (GS), JP Morgan (JPM) and one credit card company, American Express (AXP). And he keeps adding more! Buffett’s portfolio shows that he is extremely bullish about American banks today. I haven’t heard Buffett provide a specific answer to that question. But my view is that it’s because we have entered a “golden age” for owning these companies. This sector is going to have multiple years of rising earnings and rising share prices. First — Interest rates are rising. As that happens, the spread between what banks lend money at and what they pay on deposits widens. That means that earnings for these banks will keep heading higher. After decades of getting squeezed, banks are ready to have some fun. Second — The balance sheets of American banks have never been cleaner or stronger. After the financial crisis, the US Government forced the entire sector to shore up their balance sheets by raising capital and retaining earnings. On top of that, those balance sheets have been subjected to unprecedented levels of scrutiny since the crash. The skeletons have been removed from the closet. Third — The onerous regulatory requirements enacted in a knee-jerk response to the financial crisis are being eased. That is lowering the amount of money that banks have to spend meeting those requirements. Less red tape and paper work equals bigger profits. Fourth — The amount of money that these companies are returning to shareholders is increasing quickly. Now that the banks have strengthened their balance sheets, the regulators are allowing for increased payments of dividends and repurchases of shares. Share repurchases and dividends to shareholders have been restricted for some banks since the financial crisis by regulators. Hey… there had to be some restrictions in lieu of the taxpayer bailing out the industry! Put it all together and we now have safe companies, rising earnings, and increasing payments of cash to shareholders. Not to mention reasonable price-to-earnings and price-to-book valuations. Pretty simple bullish case isn’t it? In total, Buffett purchased $13 billion of shares of bank stocks in the third quarter. Two of the companies purchased were banks that Berkshire did not own going into the quarter. The first new position was JP Morgan, which is now the tenth biggest position in the Berkshire portfolio. Buffett spent $4 billion buying shares of JP Morgan in the third quarter. Keep in mind that is a big initial position, even for Buffett. With legendary CEO Jamie Dimon at the helm, JP Morgan is widely viewed as the best run of the Big Four investment banks and sports the highest returns on equity. The stock currently pays almost a three percent dividend. The other significant new bank stock purchased by Buffett during the third quarter was an $829 million accumulation of PNC Financial (PNC). 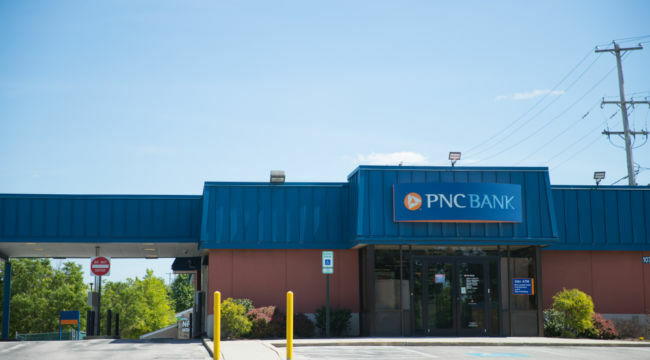 PNC is the eighth largest bank in the United States by assets and the stock also yields just under three percent. Would I follow Buffett into these two companies? You’re darn right I would. What I also think we should take away from Buffett’s third quarter stock purchases isn’t so much that he likes these two specific bank stocks. Rather, I believe that the takeaway is that Buffett loves the entire sector and is widely spreading his bets across several different companies. With almost $80 billion invested and still buying, this is Warren Buffett pounding the table on American bank stocks. And given how seldom he gets really bullish on anything, I think his actions are worth paying attention to.